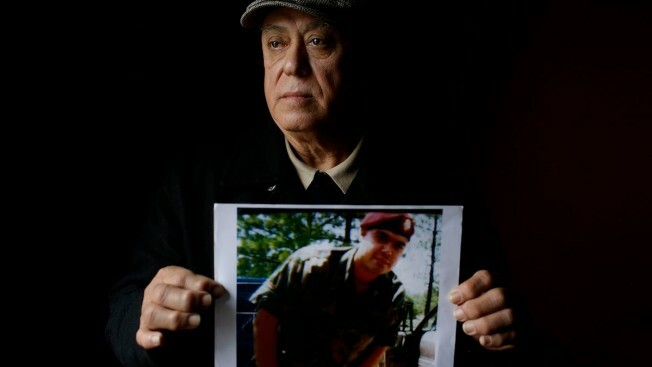 In this file photo, Miguel Perez poses as he holds a photo of his son Miguel Perez Jr., on April 4, 2017, in Chicago. Federal authorities deported a military veteran who served two tours in Afghanistan but was later convicted of drug crimes, an agency spokeswoman said Sunday. In a statement, the spokeswoman, Nicole Alberico of Immigration and Customs Enforcement, or ICE, said immigration agents returned Miguel Perez Jr., 39, to Mexican authorities on Friday. Perez had lived in the United States as a legal permanent resident since age 11. He was convicted in 2010 of manufacturing or delivering more than two pounds of cocaine in Cook County, Illinois. In an email to NBC News, Perez's lawyer, Chris Bergen, said Perez was left with no money and only his orange prison uniform. "He was dumped in one of the most dangerous areas of the Mexican border," Bergen said. "We will continue to fight his case and appeal his citizenship denial."